Josh McDaniels began his coaching career in 1999 as a senior graduate assistant for the Michigan State Spartans. Taking a year off, he took a job as an assistant for the New England Patriots and worked his way up to become their offensive coordinator by 2006. In January 2009, McDaniels was hired as the Denver Broncos’ head coach, but in under two seasons was fired after an 11-17 record. McDaniels then moved to the Rams for one season and finally to the Patriots to rejoin Bill Belichick for the second time in his career. Against the Washington Redskins, McDaniels called two plays that in particular stood out to me that showed great execution by the team utilizing his players’ strengths on the field. The first play is the 21 Blast TE Trap, while the second is a play-action end around running back screen. Note: Check out his slant-flat concept in the Super Bowl as well. 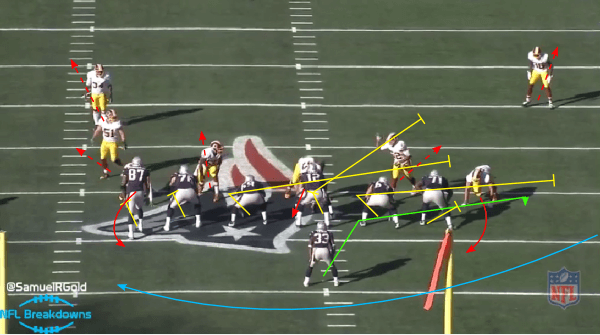 The Patriots pre-snap motion tight end #87 Rob Gronkowski from the right side to the left side of the offensive line. 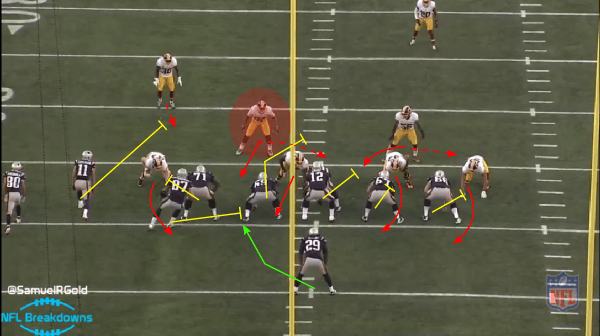 This shifts Redskins’ linebackers #56 Perry Riley and #52 Keenan Robinson (circled in red) to the center of the field. In this next image, I highlighted the respective roles for all of the players in the box. Since the Patriots use 11-personnel, or three wide receivers, the Redskins counter with an extra defensive back. 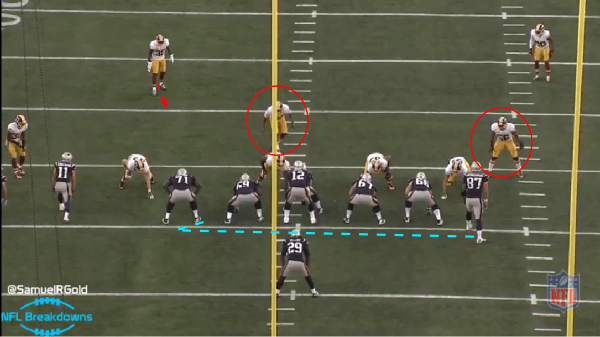 In order to stop the run on early downs, the Redskins like to walk their free safety (#38 Dashon Goldson) closer to the line of scrimmage. 1. 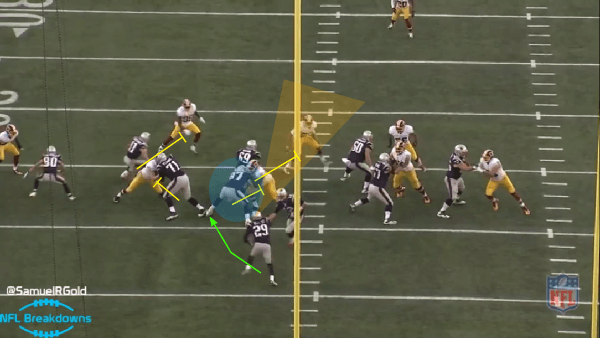 Gronkowski’s excellent tight end trap block on nose tackle #92 Chris Baker after the left guard releases to block linebacker #52 Keenan Robinson (shaded in red in the above image). 2. Speaking of Keenan Robinson, he actually reads the hole wrong. Before the snap, linebacker #56 Perry Riley is supposed to read the outside edge of Gronkowksi on the right side of the pocket while Robinson is supposed to take the strongside A-gap. Due to the fill-and-scrape roles of the linebackers, after the motion Riley takes the weakside-A gap role pushing Robinson mainly to assist nose tackle Chris Baker. 3. Wide receiver #11 Julian Edleman throws a key block on free safety #38 Dashon Goldson making room for Blount to scamper up the field. 4. Not a single Redskins defender wins their blocks, while Gronkowksi’s versatility as a dual threat tight end is utilized to keep this offensive line from falling apart. Blount ended the day with 29 carries, 129 yards, and one touchdown. Not to take away anything from his performance as he was an extremely dynamic and powerful run threat, McDaniels definitely deserves a lot of credit considering the patchwork offensive line the Patriots are currently using. 1. The play-action to Lewis keeps the linebackers at the line of scrimmage flattening their pursuit. 2. The wide receiver end around is there to pull the zone linebackers and man-to-man cornerbacks away from intended path of the play. 4. The center continues blocking defensive tackle #97 Jason Hatcher to make sure Brady is completely protected as he turns his back on the fake handoffs. 5. Tackles block normally and intentionally give the outside path to the edge defenders to pull them into the backfield to set up the screen pass. 6. Both wide receivers run streaks to pull the Redskins deep coverage up the field and away from the screen. Watch #19 Brandon LaFell block left cornerback #41 Will Blackmon 20 yards up the field. The streak was more important than the block, but this is the exact thing McDaniels, and all coaches, loves to see from his wide receivers. 7. McDaniels actually called this play twice. The second time was in the 3rd quarter with great effect gaining 14 yards on 2nd down and 20. These are two quick examples of how McDaniels uses his blockers creatively to open up holes for his running backs. 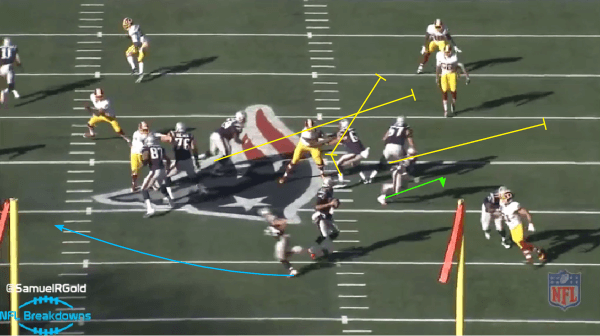 Gronkowski’s versatility is a huge bonus for this team, since McDaniels can put him in the seam on passing plays and even bring him in the box to block for Blount and the Patriots’ other running backs. Fun Fact: McDaniels worked as a plastics sales repesentative in Cleveland, Ohio in 2000 between his tenure as a senior graduate assisting coach for the Michigan State Spartans and assistant defensive backs coach for the New England Patriots.